The Darke County Fair’s Safety Committee gathered Thursday in preparation for the fair’s Friday opening. Visitors are urged to practice caution while attending the event. DARKE COUNTY — Law enforcement, fire and rescue personnel are urging fairgoers to practice vigilance and caution as they attend this year’s Great Darke County Fair. Members of the Fair Safety Committee gathered Thursday to finalize their safety plans before the Fair’s Friday opening. 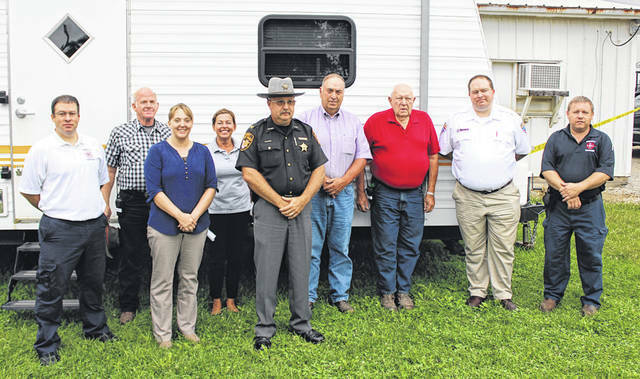 “We consider this to be one of the safest fairs in the United States,” said Darke County Sheriff’s Office Chief Deputy Mark Whittaker, noting the Sheriff’s Office has its own mobile command post at the fair. Nonetheless, Whittaker urged fair attendees to do their part to ensure a safe and enjoyable experience. Whittaker advised fairgoers to be “weather aware,” pointing out the many phone apps which monitor severe weather conditions. “In addition, if there is severe weather noted in the area, the public address system here at the county fair will be used to give some direction and give people information as to any impending weather should we have any that would be inclement or severe,” he added. Whittaker also urged attendees to practice caution on rides. “When you’re enjoying the amusement rides, pay attention to the rules and regulations on the rides. They’re there for your safety,” he said. Traffic both in and around the fairgrounds is another area where caution is warranted. “The fair traffic is extremely congested oftentimes, and speed limits that are typical for those areas need to be slowed down because of the number of traffic and cars coming and going from the fair,” Whittaker said, mentioning in particular State Routes 121, 36, 49 and U.S. Route 127. Fairgoers also should keep an eye out for suspicious or dangerous behavior. “If you see something that you think is suspicious or a problem, please report it. We encourage people to report these things,” he added, assuring fair visitors and vendors there will be law enforcement, fire and EMS presence on the grounds 24 hours a day during the fair. This entry was tagged Darke County Fair, Fair. Bookmark the permalink.